The premier also invited Malaysian counterpart Mahathir Mohammad to attend Pakistan Day celebration in 2019. The two countries agreed to enhance bilateral cooperation in trade, privatisation, foreign direct investment, food and tourism. Malaysian investors expressed interest to invest in various sectors in Pakistan, especially in the areas of education, technology, telecommunication, e-governance, e-commerce and tourism. Expressing confidence in the country’s market potential, they noted that the investment policy is one of the most liberal in the region. PM Imran assured the investors of full support, saying the chairman of Board of Investment (BoI) would ensure smooth and expeditious initiation of projects. 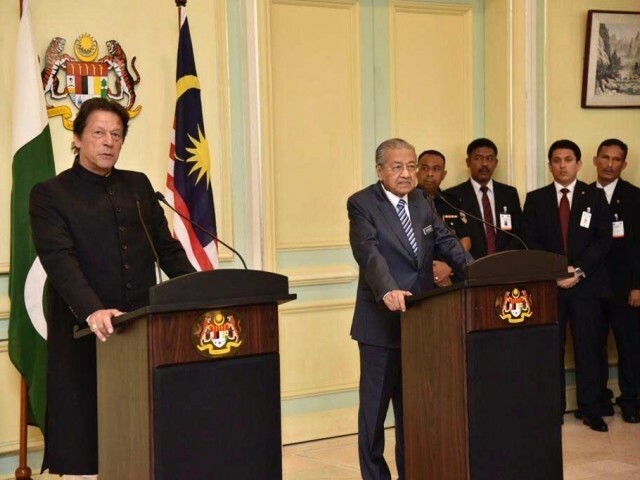 Reflecting on longstanding and substantial economic, commercial, and investment ties, both leaders welcomed continued efforts to intensify cooperation between Malaysia and Pakistan. They underpinned their shared desire to strengthen bilateral economic ties, expand trade and investment, create favourable conditions for commerce and business in both countries, particularly in palm oil, agri products, food retail, halal products, automotive parts, energy, science and technology, and telecommunication. The sole electric provider company in Malaysia, Tenaga Nasional Berhad is open to business opportunities with Pakistan including in renewable energy. Reaffirming the Malaysia-Pakistan Closer Economic Partnership Agreement (MPCEPA) signed on 8 November 2007 in Kuala Lumpur which entered into force on 1 January 2008, Malaysia and Pakistan recognised the importance of regular discussions to strengthen the trade relationship in key sectors and addressing bilateral trade imbalance. Both leaders also welcomed continuing efforts to further enhance bilateral economic relations and underscored the importance of these efforts in advancing cooperation between Malaysia and Pakistan. In this regard, both sides look forward to a possible MPCEPA Joint Committee Meeting in the near future with the intention to enhance further economic partnership. On the Inter-Governmental Agreement on Liquefied Natural Gas (LNG) between Malaysia and Pakistan signed in November 2017, Prime Minister Tun Dr. Mahathir Mohamad reiterated Malaysia’s commitment to assist Pakistan in addressing its energy shortfall. In this regard, Prime Minister Imran Khan welcomed Malaysia’s cooperation in LNG and other energy sectors including hydroelectric and renewable resources. Recognising Malaysia’s success in the high-tech industry hub in the northern state of Penang, Pakistan highlighted their intention to explore greater collaboration between high-tech industries in Malaysia and Pakistan. Malaysia invited Pakistani companies to invest in Malaysia in both manufacturing and services sectors where the companies are able to leverage Malaysia’s strategic location in expanding their investments into ASEAN and the Asia Pacific regions. Pakistan invited potential Malaysian companies to explore the possibility of investing in Special Economic Zones to take advantage of Pakistan’s strategic location at the crossroads of Central, South and West Asia. Both leaders reaffirmed the importance of the Memorandum of Understanding on Defence Cooperation and looked forward to the 13th Joint Committee on Defence Cooperation (JCDC) which will be convened in 2019 in Kuala Lumpur. Malaysia invited Pakistan to participate in the upcoming Langkawi International Maritime and Aerospace Exhibition (LIMA) in 2019. Pakistan also welcomed Malaysia’s participation in the upcoming Defence Expo IDEAS- 2018. As two peace-loving Islamic nations, the two leaders agreed to increase their collaborative efforts to uphold the true values of Islam in international fora while strengthening the solidarity of the Muslim Ummah. Both sides reaffirmed their commitment to collaborate more closely on issues affecting the Muslim world including taking joint efforts in underscoring Muslim sensitivities in attacking Muslim holy personalities and religious belief. Both stressed that terrorism cannot be associated with any religion or belief. Views were Malaysian side took note of the massive counter-terrorism efforts that Pakistan has successfully undertaken in an effort to eliminate terrorism. Both leaders witnessed the signing of the Partial Visa Abolishment Agreement (PVAA) which will reinforce the positive momentum in the bilateral relationship by broadening contact at the officials’ level between the two countries. PM Imran had arrived in Kuala Lumpur late Tuesday with his entourage of Foreign Minister Shah Mehmood Qureshi, Minister for Finance Asad Umar, Minister for Information and Broadcasting Chaudhry Fawad Hussain, and Advisor on Commerce Abdul Razak Dawood. He was welcomed by Deputy Foreign Minister Marzuki bin Yahya and senior minister Dr Muhammad bin Rafique at the Kuala Lumpur airport. On Wednesday, the premier was received by his Malaysian counterpart for an official welcome ceremony at Dataran Perdana in Putrajaya. 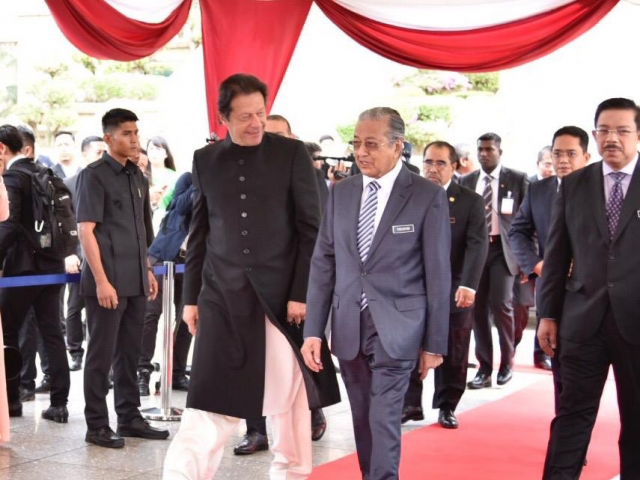 PM Imran was presented Guard of Honour at an official welcoming ceremony at Perdana Putra, Putrajaya. To become an Asian tiger, you need to have the political and economic characteristics which Pakistan lacks. Pakistani leaders have become so accustomed to getting alms that they cannot produce any wealth of their own. Living off aid has become a means of survival. The country lacks competitiveness, the economy is incapable of generating wealth and foreign investors have no confidence in Pakistan because of its reputation as a terror-sponsoring state.